Frank Allgöwer is the Director of the Institute for Systems Theory and Automatic Control at the University of Stuttgart. 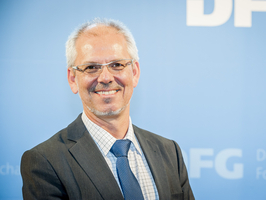 2003 - 2012 Member of the DFG review board "Systems Engineering"
Frank Allgöwer's list of publications includes eight books, over 100 journal papers and book chapters and over 300 peer-reviewed conference papers. A. Stemmer, G. Schitter, J.M. Rieber und F. Allgöwer. Control strategies towards faster quantitative imaging in atomic force microscopy. European J. Control, 11(4-5): 384–395, 2005. T. Schweickhardt und F. Allgöwer. Linear control of nonlinear systems based on nonlinearity measures. J. Process Contr., 17(3):273–284, 2007. M. Chaves, T. Eißing und F. Allgöwer. Bistable biological systems: A characterization through local compact input-to-state stability. IEEE Trans. Autom. Control, 53:87-100, 2008. D.Q. Mayne, S.V. Rakovic, R. Findeisen und F. Allgöwer. Robust output feedback model predictive control of constrained linear systems: Time varying case. Automatica, 45(9):2082–2087, 2009. U. Münz, A. Papachristodoulou und F. Allgöwer. Delay robustness in consensus problems. Automatica, 46(8):1252-1265, 2010. P. Wieland, R. Sepulchre und F. Allgöwer. An internal model principle is necessary and sufficient for linear output synchronization. Automatica, 47(5):1068-1074, 2011. M.A. Müller, M. Reble und F. Allgöwer. Cooperative control of dynamically decoupled systems via distributed model predictive control. Int. J. Robust and Nonlinear Control, 22(12):1376-1397, 2012. M. Bürger, D. Zelazo und F. Allgöwer. Hierarchical Clustering of Dynamical Networks Using a Saddle-Point Analysis. IEEE Transactions on Automatic Control, 58(1):113-124, 2013. S. Yu, M. Reble, H. Chen und F. Allgöwer. Inherent Robustness Properties of Quasi-infinite Horizon Nonlinear Model Predictive Control. Automatica, 50(9):2269-2280, 2014. G. Seyboth, D.V. Dimarogonas, K.H. Johansson, P. Frasca und F. Allgöwer. On Robust Synchronization of Heterogeneous Linear Multi-Agent Systems with Static Couplings. Automatica 53, 392-399, 2015.